VMware has addressed a lot of bugs with their Update 1a for vSphere (ESXi and vCenter), one of them being the long awaited "renaming" feature when SvMotioning a VM. This "feature" slipped into vSphere somewhere in version 4.X really as a undocumented feature, as it turned out it was pretty useful for online renaming of VM's. The team responsible for Storage vMotion thought differently and reported this as a bug that needed to be fixed, which they did with the introduction of vSphere 5.0. After a lot of "complaints" from VMware customers around the globe they re-introduced the bug / feature again with Update 2 for vSphere 5.0, but the feature acted differently then before. The feature would now only rename the folder of the VM on the Datastore, but would not rename the files that make up the VM. Now with vSphere 5.1 and Update 1a the latter is possible again, but not out of the box. You will need to add a advanced feature to the vCenter settings for it to work again. So now you have a choice if you want to use this renaming feature or not, which is a nice gesture but why leave it disabled by default. In my opinion it would have been better to have it enabled by default with the option to disable it. For sure there VMware will have a good reason why they didn't do it. 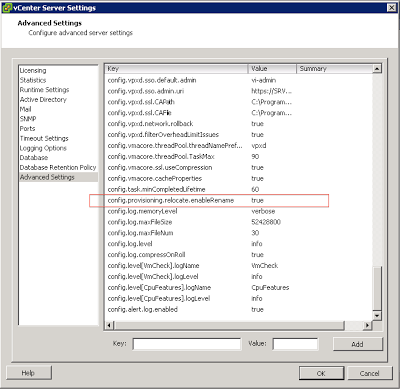 Anyway, if you want to use the feature and keep your VM names consistent with the corresponding folders and files on the Datastore you will have to add the following key "provisioning.relocate.enableRename" to the "Advanced Settings" in "vCenter Server Settings" the key needs to get the value "true". After adding the key it will show up as "config.provisioning.relocate.enableRename"
And after closing "vCenter Server Settings" the renaming of VM files during a SvMotion should work. VMtools on vSphere 5.1 reboot no longer needed ?